Rececntly featured in the Brainerd Dispatch best friends Traci Galles and Carmen Maendel are enjoying success with their own online and trade show company Genoa Denim and Leather Apparel. Named after the birthplace of Denim this company sells designer jeans with bling to name brand handbags and rhinestone encrusted hats sometimes right out of their van. Taking a leap of faith the two best friends enjoy working for themselves and see the challenges as opportunities to succeed in a difficult industry. The two where featured in this article and ended up purchasing two newspaper framed article plaques that they hang proudly in their homes. The photo of the newspaper frame was shared with us on our Facebook page. 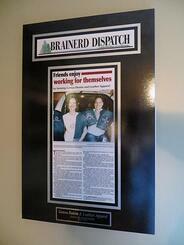 At In The News Inc we mount and preserve newspaper articles like the one about Genao Denim and Leather Apparel in the Brainerd Dispatch ever day. These truly unique success stories can be found in newspapers all across the country. Luckily we subscribe to a majority of those papers and have access to them to create wonderful wall displays. If you have articles and want them framed then get started today. Click our button below to learn more about In The News. In The News, Inc. creates made-to-order wall displays for each of our customers, and we always give our first-time customers a chance to see the finished piece in person, with no obligation to purchase. Click here to learn more. You can also visit our website @ www.inthenewsonline.com or call us @ 800-548-3993.